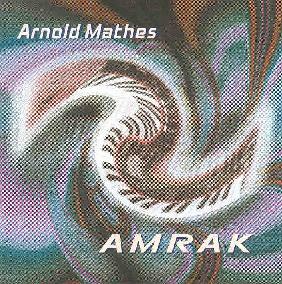 Not being someone so well versed in electronic music that I could write a treatise on the subject as I am sure Arnold Mathes could, the artist behind "Amrak", a fine self released CDR release which seems to be a masterful piece of work to my ears, borrowing influences from everyone from Klaus Schulze to Harvey Bainbridge, I will have to commend this CDR as a piece of work so entrenched in the farflung reaches of inner cosmos that I can't help but like it a lot. Perhaps Schulze's "Timewind" and Bainbridge's "Interstellar Chaos" are good starting points. I find his cosmic synthesizer music to be appealing and relaxing, calling forth cosmic soundscapes to my head. It is like "Phaedra" era Tangerine Dream jacked up a few levels of punk to something indescribable really. I find it infinitely enjoyable. Some bleeps make me feel like an android just about to be activated, reminding me of Hawkwind's more modern excursions. It's quite angelic and cosmic stuff and comes recommended. Tracks: "Gateway", "Sonik Sekretion", "Somethingness", "Thunder Riders", "Crush Depth", "Slam The Radon", "A Short Excursion". The instruments used were a Korg Karma Synthesizer and a Korg D16 Digital Recording Studio. For more information, you can email Arnold Mathes at: amathes.1@netzero.net. All CD's are $14 postage paid from Arnold Mathes, 2750 Homecrest Ave., #320, Brooklyn, NY 11235.